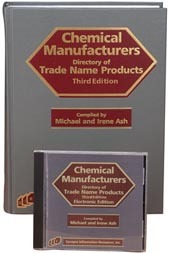 The Chemical Manufacturers Directory of Trade Name Products centralizes information about the chemicals and materials that are produced for the worldwide chemical market. It provides brief descriptions of products from more than 3500 international sources. Through an ongoing, exhaustive program of investigation, including direct communication with chemical manufacturers and chemical trade journal research, we are able to provide users with essential information on more than 71,000 chemical and material trade name products currently sold. Because there is no charge associated with the listing of the chemical products, this Directory includes the most significant representation of chemical manufacturers throughout the world. MANUFACTURER entrieslists multiple worldwide branches and full contact information followed by alphabetical listing of TRADE NAME Descriptions with concise CHEMICAL DESCRIPTION, APPLICATION/FUNCTION, and specific MFG-Branch information. Hyperlinking: Trade names to Descriptions in Part I and MFG-Branches names to Part I MFG information.